How Did DEWALT DWE315K Oscillating Tool Become the Best? 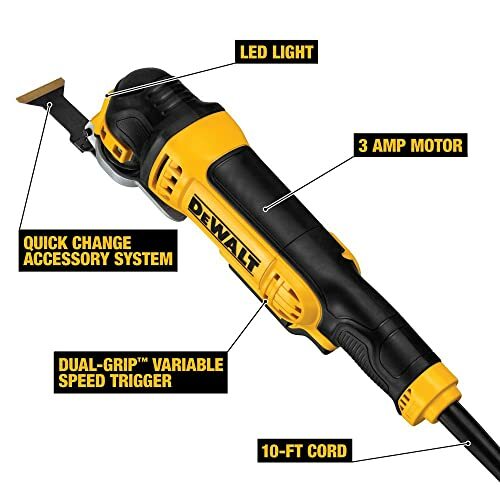 The first thing you notice when you lift this tool is the distinctive black and yellow color that depicts the DEWALT brand. A brand that has won the hearts of many users due to the quality workmanship of its tools. 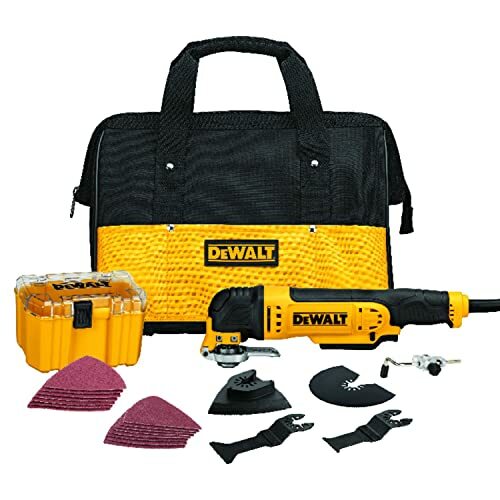 DEWALT DWE315K features a bullet-like shape just like most oscillating tools in the market. It has plenty of power and very easy to use. The tool is definitely a time saver when doing multiple tasks like renovations. During my kitchen cabinet doors makeovers, I could easily use the fast-cut wood blade when cutting into the door board and quickly change to a sandpaper when fine sanding the edges. The process was simple and easy with a quick detach of the blades and attaching the sanding pad and sandpaper. Unlike other tools, I didn’t need a holding tool like a wrench to grip-hold in the process. I found it really nice when making angle adjustments to cut door knob areas. I have owned several oscillating tools before, but this DEWALT Oscillating Tool stood out from the rest. As a DIYer who jumbles from building to remodeling tasks, I found it thrilling when working with the various assortment of accessories that comes with this tool. In a simple remodeling task, I might find myself using the semi-circle blade to make a cutting guide on wooden board edges. Then, I will go for the fast-cut wood blade to make the actual cutting, before finishing with a sandpaper on the same area. I hadn’t thought that having the ability to create a universal fit system with the help of an adapter would serve as a benefit when I first bought this tool. Not until when I did a makeover on my son’s playing field! The adapter gave me the option to use a Grout Removal Blade when I worked on seesaw logs and swings set posts. I could still perfectly use the Platinum Bi-metal Saw Blade to cut metal rods in the process. The adapter gives users the ability to use endless options of attachments with the tool. Apart from the ease of working around with this tool, it proved to be very powerful. With its 3.0-amp motor, you will manage to do a lot within a few minutes. During my occasional home improvement exercises, I find myself cutting rafters in tight spots close the ceiling, plastic and PVC pipes, and other rough surfaces within a short duration with this tool. Also thanks to the LED light and guide system, you can make more accurate cutting in tight spots. DEWALT DWE315K Corded Oscillating Tool feels solid when working. Even with the noise that it makes while vibrating, you will still make accurate cuttings with it. The ease of control allows for its use from any angle while operating it with just the trigger. I find it best when using both hands on this tool while sanding or cutting. This way, it’s much comfortable and accurate. With just one hand, the vibration might drag you away from the cutting line or sanding area. The following tips will help you in bettering your work experience and improve your safety when working with this tool. Once you get used to the DEWALT DWE315K Oscillating Tool, I guarantee that you will never turn back to your old ways of sanding and cutting. The ability to incorporate attachments from other brands with its universal fit adapter makes it a “must-have” tool for any DIYer or home builder. Even with the few drawbacks, I am still convinced that what the tool can offer is incomparable with what other oscillating tools in the market will.